Offer valid on all Paytm payments via Scan QR Code. Offer is applicable once per user in 1 month. Offer is valid only in Kolkata. Columbia Asia Hospital Salt Lake, a multi-specialty facility is located in the up market Salt Lake locality of Kolkata. It commenced operations from July 2008 and in a short period has become the preferred healthcare provider for people from Eastern India and is considered as one of the best hospitals in Kolkata. The 100-bedded hospital is well equipped with Operating Theatres, Dialysis Center, Advanced Digital Catheterization lab, Chemotherapy units, Telemedicine and Teleradiology facilities. The people of Kolkata receive the best possible medical care by qualified consultants trained in India and abroad. Columbia Asia Hospital Salt Lake aims to be a one-stop destination for all your health care needs. It offers a comprehensive spectrum of clinical services including Obstetrics & Gynecology, Internal Medicine, Cardiology, Urology, General Surgery, Psychiatry, Pediatrics, Ophthalmology, ENT, Gastroenterology, Orthopedics, Dermatology and Plastic Surgery. The hospital has international standard infrastructure and follows globally benchmarked standards of medical, nursing and operating protocols. The facility is rapidly becoming the preferred healthcare destination for International Patients. 1. 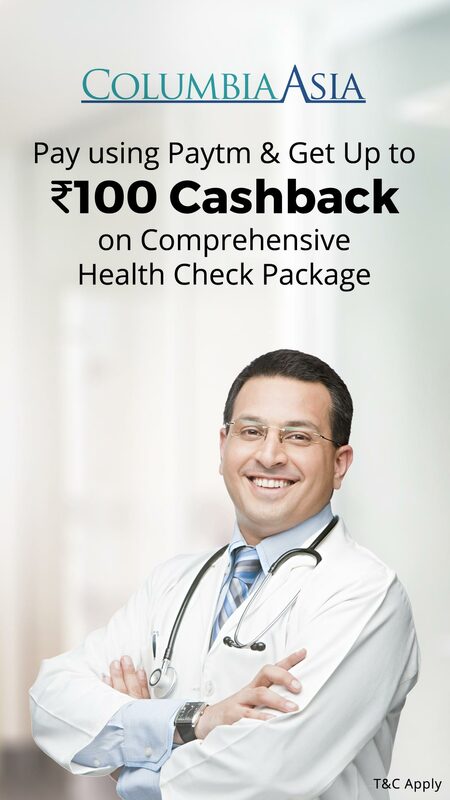 In this deal, you will get Up to Rs.100 cashback on Comprehensive Health Check Package. 2. Valid at Columbia Asia Hospital, Kolkata. 3. Valid till 30th April 2019. 4. Maximum cashback applicable is Rs.100. 5. Package Inclusion: CBC with ESR, Blood Grouping - ABO and Rh, Blood Glucose Fasting & PP, Lipid Profile, Liver Function Test, Serum Creatinine, T3, T4, TSH, Ultrasound Abdomen & Pelvis, Urine Routine, X-Ray Chest, ECG, Stress Test, Pulmonary Function Test (spirometry), Pap Smear (Female), Uroflowmetry, Consultation with Doctor, Consultation with Urologist, Consultation with Opthalmologist, Consultation with Gynaecologist, Diet Consultation & Breakfast. 7. Offer is applicable once per user in 1 month. 8. Offer cannot be clubbed with any other offer. 9. Cashback will be credited within 48 hours. 10. Any service over & above the mentioned will be charged extra. 12. No refund or adjusting the payment towards any other services is allowed. 14. This offer is valid only on payments done through Paytm QR code. 15. In case of any disputes, the customer needs to get in touch with the merchant/brand. 16. According to RBI's new guideline, Cashback will not be processed for NON-KYC users. Get your KYC done to receive the cashback. Visit http://m.p-y.tm/minkyc to do your KYC in a single click. Please ignore if already done. Pay using Paytm (valid only if payment is done through Qr code) at the outlet. Post successful transaction, cashback will be credited within 48 hours.